Now for something a tad bit different. Up to this point, I have concentrated on Poodles in fashion, culture and design. 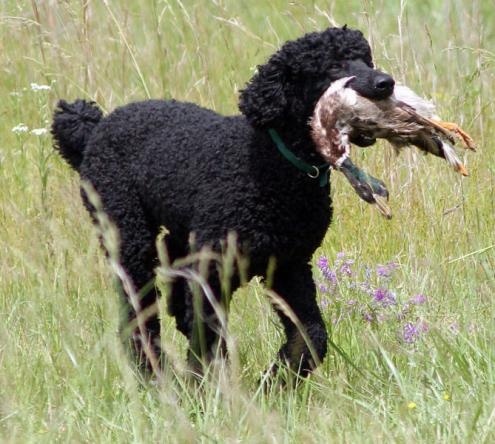 But Poodles originally had a very different role in society. All Poodles descend from the ancient standard size dog and that dog was a retriever. Even the origin of the word "Poodle" emphasizes this. Poodles originated between France and Germany where it was known as the Pudlehund. "Hund" in German is dog and "pudel" comes from a German verb "to splash about". The breed was standardized in France where it became a water retriever. Poodles (or in France, the Caniche) became so popular that they were bred into the forms that fitted into everyone's life style. 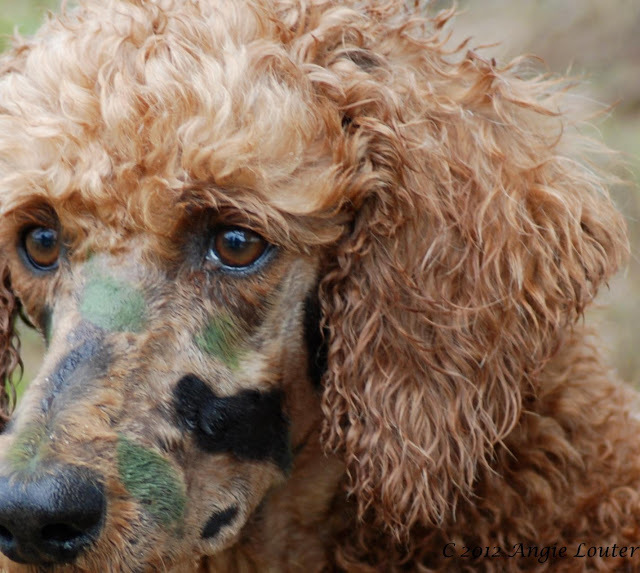 Today, Poodles are the national dog of France. 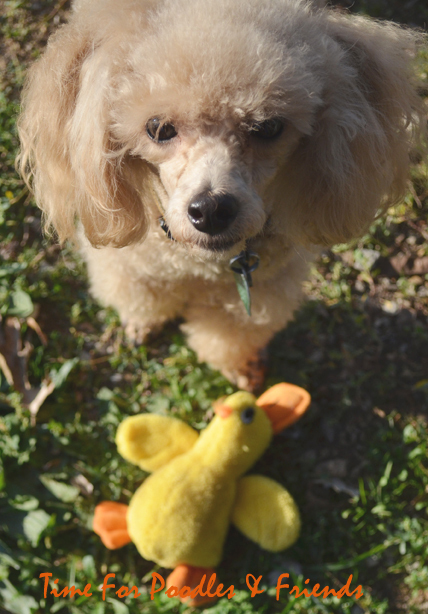 But all our Poodles, even if we have toys or miniatures, harken back to this retriever tradition. 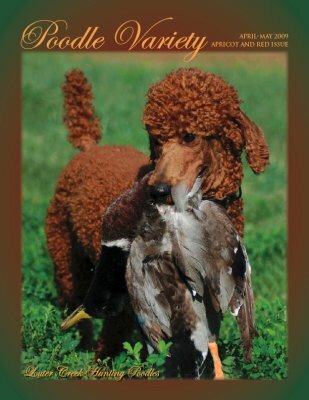 Below are photos with links to good articles with more information on the new resurgence of Poodles as hunters. I am not a hunter but find this fascinating. From an article in a 2008 New York Conservationist Magazine. One of Lakelands hunting Poodles from their site. They have great photos of their dogs in action either in hunting or trials. featured in a numerous hunting magazines. 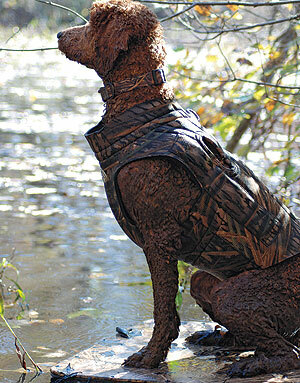 This photo is from an article of Gun Dog magazine (Sept. '11"). Here is an extra photo from Louter Creek. They used this as one of their profile pictures on FaceBook last Fall. I love in intense look on this guy's face. Click here for the link to Louter Creek's Facebook page. I wish it could be either subscribed to or a page to like, but it is not. I have enjoyed being a friend because I can keep up with their activities. 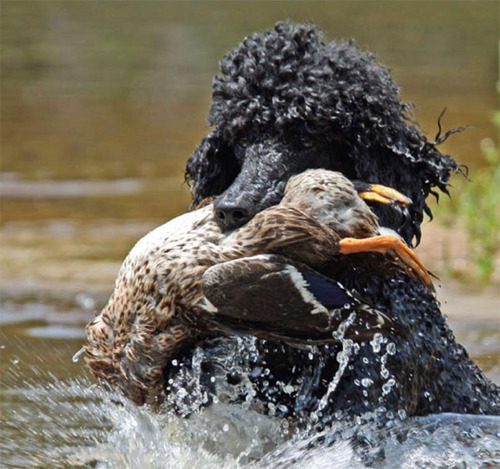 Louter Creeks Poodles have been featured on A&E's reality show Duck Hunters. OK, I retrieved the duck, so where is the treat?